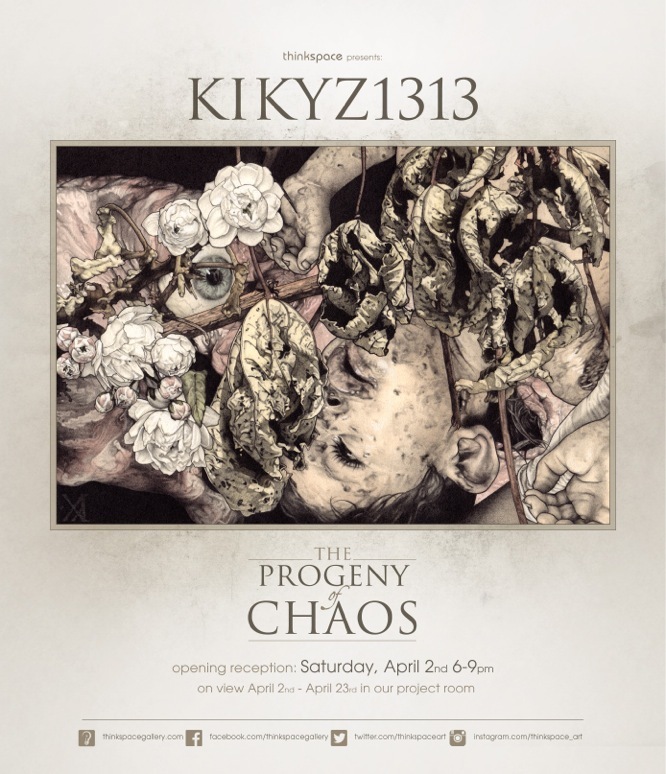 Thinkspace is pleased to present Progeny of Chaos, its debut solo exhibition of work by KIKYZ1313 in the gallery’s project room. Laura Lucía Ferrer Zamudio was born in Querétaro, Mexico, and creates beautifully intricate ink, graphite, and watercolor works on paper. From beneath the initially alluring, and understated, first impression of the works, emerge unexpected oppositions and abject tensions. Studies in the afflicted wretchedness of humanity, her work is neither despondent nor obviously gory, but rather presents an aestheticized nightmare of sublime abhorrence; ambiguously gorgeous despite its agonizing discomfort. 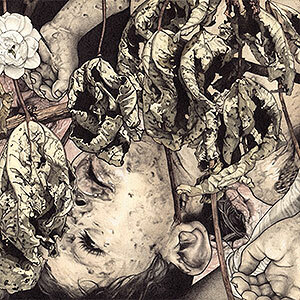 With an obsessive attention to detail and figurative rendering, KIKYZ1313’s works are realistically executed, and recall traditional techniques of late 19th century book illustration and engraving. Her palettes are muted and tempered, understated with delicate washes of ink and watercolor, and her compositions are balanced and paced, posturing as romantic and idyllic scenes of placid children and animals. Seemingly innocent at first glance, the works gradually unfurl, revealing unexpected mutations, abject subversions, and a diseased world of horrors. Filled with children’s bodies in various states of decay, decomposition and malformation, her works challenge the viewers’ initial expectations of the imagery, while tapping into the basic human fear of the body’s disobedience – especially the dread of its dissolute boundaries. The children remain dreamily calm and picturesque despite their compromised states of disfigurement, trauma and accost. KIKYZ1313 intentionally creates these tensions, encouraging the viewer to approach the content critically and analytically, questioning the validity of their initial impressions. A sort of moral chaos presents itself, when faced with images of children in unexpected states of disturbance. Exquisite and repulsive, the conflict of viewing is inexpressibly complex. KIKYZ1313 received a BFA from the Universidad Autónoma de Querétaro, and had her first solo exhibition at the Museo de la Ciudad de Querétaro. She has completed an artist residency at the Nordic Watercolor Museum in Skärhamn, Sweden.